An album unlike anything else I’ve covered so far, Titanic: Music from the Motion Picture is the biggest selling album to be mostly an orchestral score. Obviously there are vocals every now and again, one instance of vocals in particular I’ll get onto soon. Otherwise it’s mostly orchestral score with a synthesized choir over the top, which is what gives the whole soundtrack this strange ‘Disney at church’ quality. Something like Leaving Port is straight out of an animation, full of rolling crescendos and epic strings. Obviously this fits the style of the film Titanic itself perfectly, the ‘magical’ aspect of the love story on screen is what made it so loved by fans. James Horner’s most popular and most recognisable score to date, Titanic’s music was so integral to the success of the movie and vice versa; it all but revolutionised the relationship between music and film. Of course I need to mention My Heart Will Go On in this context, as this song and its ties to the film; the cinema experience; the radio at the time; everything just clicked into place. Having a hit single to go alongside your film certainly wasn’t a new thing, you only need to look at the 80s to see countless hit songs attached to films by name only, or something like the Bond franchise where in most cases the songs are more timeless than the films themselves. My Heart Will Go On was so HUGE though that it’s probably the thing that pushed Titanic over the edge into the stratospheric success it ended up having. At least half of the tracks on this soundtrack contain that theme, Rose’s Theme to be more specific. While this works on screen, for a listener it just means that hour long wait for Celine to turn up feels even longer, there’s only so many different wind instruments I can hear play Rose’s Theme. As a musical score James Horner certainly does the job here, everything is suitably easy on the ear and the light and shade of pieces like Distant Memories allows for some truly epic moments. It’s still crazy to think that Titanic: Music from the Motion Picture was released just 4 days after Celine Dion’s own Let’s Talk About Love, giving buyers two ways to buy My Heart Will Go On if that’s all they wanted. An album so popular it managed to keep Shania Twain’s world conquering Come On Over off the #1 spot in the US, this is a one of a kind release, even if I have no plans of returning to it. It probably doesn’t help that I *whispers* can’t stand Titanic *whispers*. Best Track: My Heart Will Go On is obviously the reason we are here, even if I personally much prefer the poppier version with bonus backing vocals that features on Celine’s album. 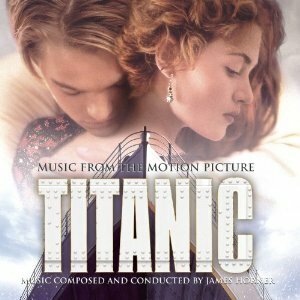 Tags: Celine Dion, James Horner, My Heart Will Go On, The World's Greatest Hits, Titanic, Titanic: Music from the Motion Picture. Bookmark the permalink.